Hidden Gems And 'Killer Stuff': A Flea Market How-To You've got to get up early — before dawn, even — to really make a killing at a flea market. So says Maureen Stanton, whose new book explores the subculture. It's called Killer Stuff and Tons of Money: Seeking History and Hidden Gems in Flea-Market America. The flea market day starts long before the crowds stream in, says author Maureen Stanton. And that's when the real deals go down. "The dealers are here, sometimes right at the crack of dawn," she tells NPR's Laura Sullivan. 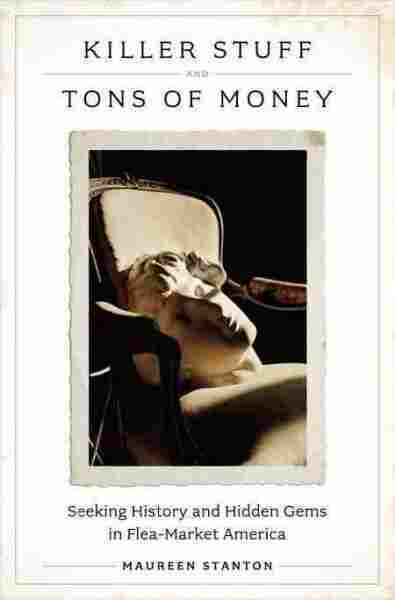 "The antique dealers, generally, are 'picking' the other tables ... looking for the thing that they can resell for double or triple or 10-fold." Stanton has written a new book about this growing subculture, Killer Stuff and Tons of Money: Seeking History and Hidden Gems in Flea-Market America. Her main character is a man she calls Curt Avery. That's not his real name; she agreed to the pseudonym because he wanted to stay under the radar. "He can look at a batch of things and he can find the thing that's valuable," she says. Stanton spent months on the road with Avery, observing the flea market subculture and absorbing his extensive knowledge. Stanton writes that Avery developed his "laser vision" over the course of two decades and has a house full of bad purchases to prove it. 1. Early bird gets the worm. This adage really applies in the antiques/flea market culture. Some dealers peruse newspaper classified ads for yard sales and will then knock on a seller's door the night before the sale. (I'm not advocating this — it can annoy the homeowners, but sometimes they're happy for the early sales.) At flea markets and antique shows, a lot of the action happens in the parking lot during the setup before the show opens. It's still fun to go to flea markets any time of the day, and there is always the chance that everyone will have missed the prize on the field, or a dealer will pull something out of a box later in the day that she or he had forgotten to unload in the morning. But if you are serious about finding a treasure, try getting up and being the first one at the flea market. 2. Get some gear — a loupe, a small flashlight, magnet, a note pad, cell phone or smartphone. A few simple tools will help you find the treasure and prevent mistakes. If you love antique jewelry like I do, then a loupe or small magnifying lens is critical for seeing the tiny "sterling" or "925" mark (which indicates the silver content). A magnet can help you detect real silver, which will not cling to the magnet as steel and iron do. A loupe is also useful for looking for maker's marks, signatures and, importantly, wear patterns. A pen flashlight can help to see these distinguishing marks as well, and for indoor flea markets or antique shows, helps to see details when the lighting is poor. With a notepad, you can write down information about an object and research it when you get home. Also, for very large flea markets and shows, it helps to jot down the booth number or vendor's name and the quoted price if you want to think about an object, or peruse the show for a similar one that might be priced lower or in better condition. With a cell phone, you can send a photo to someone who can do a bit of quick research for information not easily found on Google, or take a picture for later study. With a smartphone, you can check the latest values for some things through searching eBay or other auction sites. 3. Look for signs of age. 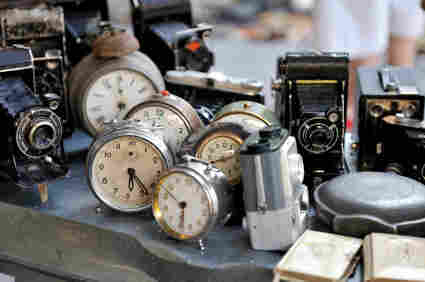 If you are hunting for antiques or vintage items, first look for signs of authentic age. There are many reproductions of antiques that look old because they are made to look old — depression glass, old apothecary jars, wrought iron furniture or baskets, sconces, decrepit-looking boxes or shelves, spice cabinets, beaded objects and tribal arts. As dealer Jimmy Desjardins said in Killer Stuff, "Glass has been faked for seventy years so even some of the fakes are almost antique now." Perhaps the single best way to detect "repros" and fakes — or at least your first line of defense — is to examine the object carefully for wear. This is where the loupe and flashlight come in handy. Dirt in crevasses that builds up over decades or even centuries, rust from nails that bleeds into the surrounding wood, dull spots on the rims or bottoms of glass objects, "crazing" or fine crackle lines in the glaze of pottery — these can reveal age. But be aware that "wear" can be faked, too. If you want to buy an expensive antique, your best bet is to talk to the dealer, get background on the object and ask if you can return the object to the dealer if you later see a flaw, crack, repair or other mark that indicates it's not real. 4. Talk to dealers — your local experts. Antique dealers — the best ones — are also enthusiastic teachers. They love the objects, and they love to share that passion and appreciation with people who are sincerely interested in learning. Good dealers are connoisseurs and will happily teach you about how to find good examples and what to avoid. Even if you are not buying anything from them at that moment, you may become an enthusiast and buy something later from them or from another dealer, which helps the trade overall. By talking to dealers, you can find out where they procured the object, which gives you some background (has it been hiding in an attic for decades? ), and how much they know about it. Once you find a knowledgeable, trustworthy dealer, stick with him or her. The person can be on the lookout for objects that interest you for your collection or your home decorating. 5. Develop your eye — and your ears and nose, too. There are ways to assess an object beyond just looking at it. Use all your senses. For example, pinging or tapping glass or ceramics can reveal nearly invisible hairline cracks, which resonate a certain tone, or composite materials that sound "off" and indicate a repair. By carefully feeling the surface of crockery, you can detect subtle differences in temperature where patches have been added to hide a crack or break. Your nose can alert you to wood that has been "smoked" to add age, and by rubbing your fingers over Bakelite, you can tell if it's real because it exudes an oily smell when slightly warmed by friction, unlike newer plastics. I've watched Curt Avery (or other dealers in his booth) smell rugs and old crocks, caress the surface of glassware, press a fingernail into wood, knock on stoneware to listen for cracks, hold objects up against sunlight to check for crizzling and run his hands around the legs of chairs to see if they are "out of round," which usually indicates authenticity. 6. Be Sherlock Holmes. Synthesize the clues. Discerning treasure, scoring a "find," is a matter of synthesizing information and putting the object in context. Is this piece authentic, a desirable category (not all antiques are trendy or "hot" categories), with the right wear patterns, in a rare color or form? Who is selling the piece? Is this a reputable dealer? Did it just come out of an estate or has it made the rounds all summer long at shows? What time of day did you find it? If something has been sitting at an outdoor antique show or flea market for two days — a show at which there are many knowledgeable buyers — chances are the piece that looks real and valuable may not be; otherwise, it would have been snapped up. All these clues reveal something about the provenance and value of the object. If one of these "clues" is not right, then it might indicate that the piece is not right, or has problems. Every aspect of the object should check out as "real" when you put it all together. I made many mistakes early on by buying something based on a single attribute. For example, I bought a signed "Wedgwood" tile for $20 because I knew that Wedgwood objects could be really valuable, especially if they date back to the mid-18th century. But I didn't know until later that Wedgwood made porcelain objects through 1987, until they merged with Waterford. (And objects are still manufactured with the Wedgwood mark.) Since it wasn't old my piece was worth ... about $20, just what I'd paid. I forgot to look for wear and I didn't really do my homework on Wedgwood. Of course, I learned from that mistake. And I did get a beautiful piece of tile in the process. Magazines and trade papers about antiques are filled with valuable information. Articles on particular categories — Liverpool pottery, for example, or needlework samplers — are rich with historical facts, photos and esoteric information. Trade papers have timely reports from auctions and show sales that provide valuable information on prices that objects command on the market. (Some antique shows offer complimentary trade publications — though there is sometimes a fee to get into the show itself.) Consult books on any category of objects that you are interested in collecting or buying — but not general price guides, which have potentially outdated, possibly misleading, and shallow information across many categories. Try books that focus on a single category of objects or a single maker. Avery calls these reference books "eye trainer's," which build your knowledge base when combined with the "field research" you get from just being out at flea markets and antique shows. Sometimes, the only way to learn about a category of antiques or collectibles is to take a chance and buy something that you suspect is valuable. If it turns out to be a fake, then chalk it up to the cost of your education. If you leave it behind, not only have you potentially missed a great thing, but you may have also lost the chance to take the piece home and do some research. And if it turns out to be fake, then you'll never make that mistake again. There is a very long learning curve to become a good antique dealer, or even a knowledgeable collector. Antiques Roadshow, American Picker, Cash in the Attic and other shows have skewed the reality so that people think finding great antiques and treasures happens easily and regularly, with little actual study and experience. That is just not true, so be patient. Collecting or antique and treasure hunting takes skill, study, wits, and work, but it's a skill that is available to anyone willing to invest some time and effort. The learning curve may be longer than it appears from popular shows, but there is fun and excitement along the journey, as well as good investment potential. 10. Follow your heart. Buy what you love. Unless you are buying something to resell, perhaps as a hobby-level dealer or on eBay, ultimately, you have to live with your object. Buy objects that amuse and delight you, that you find aesthetically pleasing, or objects you will use. When I first began to shadow Avery, after I got a little knowledge (stress on little), sometimes I'd buy an object for $2 or $5 at a yard sale that I knew was probably worth $20 or $30. I couldn't resist, couldn't walk by what seemed like an easy profit. But I didn't love the objects, and I was not transforming myself into an antique dealer, so why was I buying them? They just started to fill storage bins in my shed. Later, I changed my habits and ignored those lesser items that I didn't love, even if there was a profit still left in them. I decided to buy fewer but better antiques, things I truly loved to have in my home, things that cost more but were in better condition or were of higher quality altogether, which means they might better retain their value. And in the meantime, I get to enjoy them in my home.